http://saturn.jpl.nasa.gov/news/press-r ... newsID=826 NASA reports undersurface ocean on Titan Is there an EU take on this? starbiter wrote: Is there an EU take on this? ...it should remind us that Saturn is full of that stuff too and that Titan was - literally - born out of Saturn. Just like Venus who´s atmosphere is "surprisingly" similar to that of Titan. starbiter wrote: http://saturn.jpl.nasa.gov/news/press-release-details.cfm?newsID=826 NASA reports undersurface ocean on Titan Is there an EU take on this? So, they say that features were 19 miles away from where they were expected to be...?? And their hypothesis is that the crust has somehow "shifted?" Did all the features move as a group to some new location relative to other locations? Or did the entire planet simply rotate faster than expected, such that features were further along than they "should have been?" I was somewhat bemused when I read this article. Why do we not see this shift of surface features on other planetary bodies with subsurface oceans, such as Europa, Enceladus or Earth? Also, Titan is tidally locked in synchronous rotation with Saturn which makes the proposed surface feature shift even more weird. And would this difference in rotation between the surface and the centre of the moon not be analogous to the internal dynamo proposed to produce planetary magnetospheres, as Titan does not have one. Titan and Earth have much in common, but not when it comes to sand. On Earth, sand grains form by breaking things down, but on Titan, the opposite may be true - with much of the sand a product of building things up. That's one theory Cassini scientists are considering after studying Titan's massive sand dunes with the visible and infrared mapping spectrometer on the Cassini Saturn orbiter. The new observations raise the possibility that much of the sand grows from hydrocarbon particulates fallen from the sky that, once on the ground, join together and become sand grain-size particles. Discovered with Cassini's imaging radar in 2005, Titan's windblown dunes of dark, organic material look like mountainous drifts of coffee grounds. Since then, Cassini scientists have been finding out why and how Titan's dunes resemble and differ from those on Earth, Mars and Venus. They are gaining new understanding into the fundamental physical processes that shape planet surfaces. In the May 2008 issue of the journal Icarus Cassini scientists report that dunes contain less water ice than the rest of Titan. The dark brown sands appear to be made up of the same kind of complex organic chemicals that dominate Titan's smoggy atmosphere. If the dunes are made up of the same dark material on the inside as they have on the outside, then there's simply too much organic sand to have come from erosion alone. The new findings may help explain how, once on the ground, hydrocarbon particulates the size of smoke particles might grow into sand grains through a process called "sintering" - a slight melting that welds particles together. It may be that sintering produces particles that are just the right size for sand grains - between 0.18-0.25 millimeters and no larger, perfect for blowing in the wind and drifting into dunes. Although it is far colder and lacks liquid water, the chemical composition of Titan’s atmosphere resembles that of early Earth. This, along with the organic chemistry that takes place in Titan’s atmosphere, prompts scientists to believe that Titan could provide a laboratory for seeking insight into the origins of life on Earth. Data from the Huygens probe, which touched down on Titan’s surface in January 2005, and the Cassini orbiter has shown that many of the processes that occur on Earth also apparently take place on Titan – wind, rain, volcanism, tectonic activity, as well as river channels, and drainage patterns all seem to contribute in shaping Titan’s surface. However, at an inhospitable -290 degrees Fahrenheit (-179 degrees Celsius), the chemistry that drives these processes is fundamentally different from Earth’s. For example it is methane that performs many of the same functions on Titan that water does on Earth. The Huygens probe landed near a bright region now called Adiri, and it photographed light hills with dark river beds that empty into a dark plain. It was believed that this dark plain could be a lake or at least a muddy material, but it is now known that Huygens landed in the dark region, and it is solid. Scientists believe it only rains occasionally on Titan, but the rains are extremely fierce when they come. Only a small number of impact craters have been discovered. This suggests that Titan’s surface is constantly being resurfaced by a fluid mixture of water and possibly ammonia, believed to be expelled from volcanoes and hot springs. Some surface features, such as lobate flows, appear to be volcanic structures. Volcanism is now believed to be a significant source of methane in Titan’s atmosphere. However, there are no oceans of hydrocarbons as previously hypothesized. Dunes cover large areas of the surface. The existence of oceans or lakes of liquid methane on Saturn's moon Titan was predicted more than 20 years ago. Radar and imaging data from Titan flybys have provided convincing evidence for large bodies of liquid. With Titan's colder temperatures and hydrocarbon-rich atmosphere, these lakes and seas most likely contain a combination of liquid methane and ethane (both hydrocarbons), not water. The Cassini-Huygens mission, using wavelengths ranging from ultraviolet to radio, is methodically and consistently revealing Titan and answering long-held questions regarding Titan’s interior, surface, atmosphere, and the complex interaction with Saturn’s magnetosphere. While many pieces of the puzzle are yet to be found, with each Titan flyby comes a new data set that furthers our understanding of this world as we attempt to constrain scenarios for the formation and evolution of Titan and its atmosphere. RADAR captures SAR imagery of the bright region Xanadu, only part of which was previously observed in T13. The RADAR team has targeted Hotei Arcus, as well as the possible cryovolcanic feature Tortola Facula (informally known as the 'Snail') which is seen near closest approach. T43 will also feature high-altitude SAR(1-2 km/pixel) of the west end of Tui Regio. This will be the first RADAR coverage of Tui Regio, which we know from VIMS observations to be compositionally distinct from the rest of Titan. Observations of the dunes northwest of Xanadu may show how wind is diverted around Xanadu. In combination with T13 data, T43 SAR may help measure Titan's topography and the possibly changing spin rate. CIRS continues to extend spatial and temporal coverage of Titan, from low-spectral resolution disk maps to high spectral resolution nadir and limb integrations. Getting good time resolution is very important because we are looking for seasonal changes in the stratosphere, especially the expected break-up of the northern polar vortex in northern spring. During T43, CIRS will make a number of important maps on the outbound leg, including a far-IR surface/troposphere temperature scan from +2 to +5 hours, a mid-IR limb temperature map for stratospheric temperatures from +5 to +9, and then, after a short downlink, a complete mid-IR temperature map of visible hemisphere, for inferring dynamics, winds and waves. CIRS also has two far-IR composition links to search for new molecular species in the far-IR and sub-mm ranges beyond the capability of Voyager IRIS. RPWS: As Titan is out “in front” of Saturn, the T41 through T44 flybys put the spacecraft in an ideal location to have another opportunity to see Titan outside of Saturn’s magnetosphere, in shocked solar wind ahead of the magnetosheath as happened on T32. We are interested in duplicating the flyby geometry to look for shorter time-scale phenomena in Titan’s plasma environment, so this series of four flybys, especially T41 through T43, will offer that opportunity. Audio data collected by the Huygens Atmospheric Structure Instrument (HASI), which includes an acoustic sensor, during Huygens' descent, 14 January 2005. The Visual and Infrared Mapping Spectrometer (VIMS) instrument on board the NASA/ESA/ASI Cassini spacecraft has found an unusual bright, red spot on Titan. This dramatic colour (but not true colour) image was taken during the 16 April 2005 encounter with Titan. North is to the right. In the centre it shows the dark lanes of the H-shaped feature discovered from Earth and first seen by Cassini last July shortly after it arrived in the Saturn system. At the south-western edge of the H feature, near Titan's limb (edge), is an area roughly 500 kilometres (300 miles) across. That area is 50 percent brighter, when viewed using light with a wavelength of 5 microns, than the bright continent-sized area known as Xanadu. Xanadu extends to the north-west of the bright spot, beyond the limb (edge) of Titan in this image. Near the terminator (the line between day and night) at the bottom of this image is the 80-kilometre-wide crater that has been previously seen by Cassini's radar, imaging cameras and VIMS. This colour image was created from separate images in the 1.7 micron (blue), 2.0 micron (green), and 5.0 micron (red) spectral windows through which it is possible to see Titan's surface. The yellow that humans see has a wavelength of about 0.5 microns, so the colours shown are between 3 and 10 times more red than the human eye can detect. 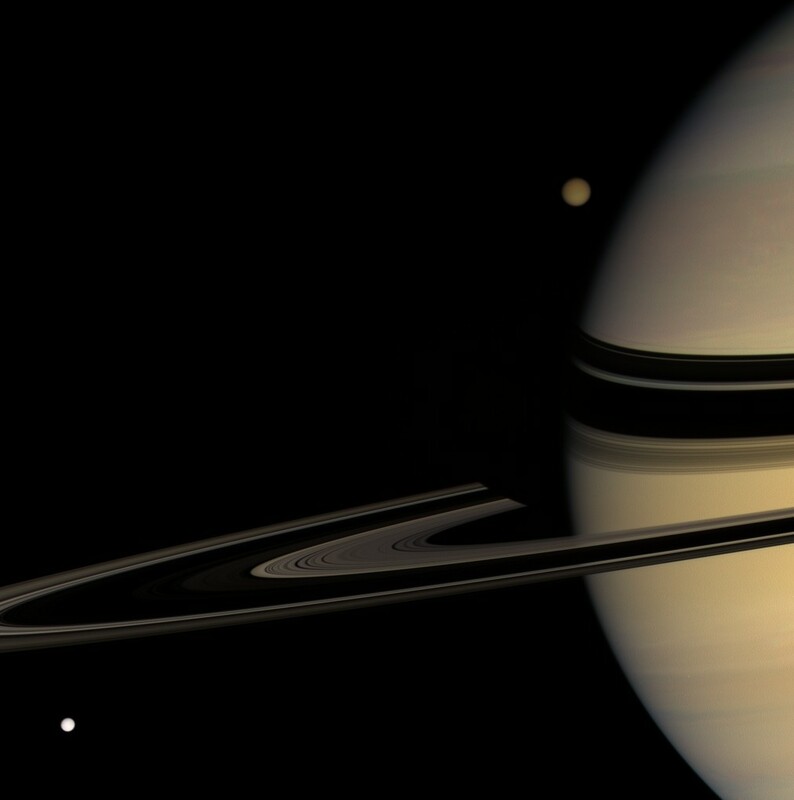 Cassini's varied array of scientific instruments show the enigmatic feature with complementary information. This montage shows the spot in infrared wavelengths from the Visual and Infrared Mapping Spectrometer (VIMS) on the left, from the Imaging Science Subsystem (ISS) in the centre, and a combination of both data sets on the right. When put together, the two different views show more than either does separately. The VIMS team noted the bright region in the image on the left after Cassini's 31 March 2004 Titan encounter. It seems clear that both instruments are detecting the same basic feature on Titan's surface. This bright patch may be due to an impact event, landslide, cryovolcanism or atmospheric processes. Its distinct colour and brightness suggest that it may have formed relatively recently. Last edited by StefanR on Fri May 09, 2008 9:32 am, edited 2 times in total. This image taken on 24 October 2004, reveals Titan's bright 'continent-sized' terrain known as 'Xanadu'. It was acquired with the narrow-angle camera on the Cassini-Huygens Imaging Science Subsystem through a spectral filter centred at 938 nanometres, a wavelength region at which Titan's surface can be most easily detected. Surface materials with different brightness properties (or albedos) rather than topographic shading are highlighted. The image has been calibrated and slightly enhanced for contrast. It will be further processed to reduce atmospheric blurring and to optimize mapping of surface features. The origin and geography of Xanadu remain mysteries at this range. Bright features near the south pole (bottom) are clouds. A bright cloud of methane particles is apparent in all three images near the south pole. Its persistence over an extensive range of colour wavelengths indicates that these cloud particles are large compared to the typical haze particles surrounding the moon, suggesting a dynamically active atmosphere near the south pole. Colour was used to enhance the various wavelengths. This is a mosaic of images of Titan's south polar region from Cassini-Huygens, taken at a distance of 339 000 kilometres on 2 July 2004. These images were acquired through special filters designed to see through the thick haze and atmosphere. The surface features become more blurry toward the limb, where the light reflected off the surface must pass through more atmosphere before reaching the camera. The bright spots near the bottom represent a field of clouds near the south pole. There are many strange dark and bright patterns on Titan's surface - linear, sinuous and circular - whose origins are not yet understood. The smallest features detected on the surface are about 10 kilometres wide. This image taken by the Cassini-Huygens Visual and Infrared Mapping Spectrometer clearly shows surface features on Titan. It is a composite of false-colour images taken at three infrared wavelengths: 2 microns (blue); 2.7 microns (red); and 5 microns (green). A methane cloud can be seen at the south pole (top of image). This picture was obtained as Cassini flew by Titan at altitudes ranging from 100 000 to 140 000 kilometres, less than two hours before the spacecraft's closest approach. The inset picture shows the landing site of Cassini's piggybacked Huygens probe. Piercing the layer of smog enshrouding Titan, this image from the Cassini-Huygens spacecraft reveal an exotic surface covered with a variety of materials in the southern hemisphere. Using near-infrared light, these images reveal the surface with unusual clarity. This colour image shows a false-colour combination of three previous images taken with different colour filters. The yellow areas correspond to the hydrocarbon-rich regions, while the green areas are the icier regions. Here, the methane cloud appears white, as it is bright in all three colours. A circular feature that may be a crater is visible in the north. Last edited by StefanR on Fri May 09, 2008 9:43 am, edited 1 time in total. A single image from the Huygens DISR instrument of a dark plain area on Titan, seen during descent to the landing site, that indicates flow around bright 'islands'. The areas below and above the bright islands may be at different elevations. This radar image, obtained by Cassini's radar instrument on 22 February 2007, shows dunes surrounding a bright feature on Saturn's moon Titan. Dunes have been previously seen on Titan, so far concentrated near the equator. They are thought to be composed of small hydrocarbon or water ice particles - probably about 250 microns in diameter, similar to sand grains on Earth. These are formed into dunes by the prevailing west-to-east surface winds, and are probably ‘longitudinal’ (lying in the same direction as the average wind) rather than transverse dunes, more common on Earth. There are several kinds of interaction between the dunes and the brighter features in this image. At the left, the dunes seem to be covering the bright material, while at the centre and right, they seem to be terminated against it. At the lower centre and lower right, they flow around it. This image set was taken at a distance of 15 000 kilometres from Titan and shows two views of an area riddled by mountain ranges that were probably produced by tectonic forces. Near the bottom of the right image, a band of bright clouds is seen. These clouds are probably produced when gaseous methane in Titan’s atmosphere cools and condenses into methane fog as Titan’s winds drive air over the mountains. It was once thought that these recurring clouds were produced by volcanic activity on Titan, but this image calls that idea into question. Cassini's visual and infrared mapping spectrometer (VIMS) has imaged a huge cloud system covering the north pole of Titan. This composite image shows the cloud, imaged at a distance of 90 000 kilometers during a 29 December 2006 flyby designed to observe the limb of the moon. Cassini's visual and infrared mapping spectrometer scanned the limb, revealing this spectacular cloud system. It covers the north pole down to a latitude of 62 degrees north and at all observed longitudes. Such a cloud cover was expected, according to the atmospheric circulation models of Titan, but it had never been observed before with such details. The condensates may be the source of liquids that fill the lakes recently discovered by the radar instrument. This image was color-coded, with blue, green and red at 2 microns, 2.7, and 5 microns, respectively. A set of three parallel ridges was seen by the Cassini spacecraft's radar instrument during the latest Titan flyby on May 12, 2008. This combination is unlikely to be a coincidence -- the best explanation for these features is that they are tilted or separated blocks of broken or faulted crust, now exposed as high ridges. Their regular spacing is typical of regions that have been compressed or extended over large areas; as an example, the western United States Basin and Range Province was formed by extension. Such interactions are called tectonics, although they do not happen in the same way as plate tectonics, which is a process unique to Earth. The ridges, which appear on the left side of the image, are rugged features and are elevated above surrounding terrain. The brightness patterns mean that the materials are fractured or blocky at the radar wavelength (2.17 centimeters, or about 1 inch). Along the south sides of the ridges are prominent cliffs, or scarps, present as thin, radar-dark lines trending west-to-east, and interpreted as faults. These features are dark due to shadowing from the radar illumination, and have heights up to a few hundred meters (several hundred feet), based on preliminary estimates of slopes. The area shown here is located in the mountainous region called Xanadu. The ridges are similar in many ways to mountain chains seen at similar latitude but about 90 degrees to the west, just west of Shangri-La (observed during a flyby in October 2005, Dunes and more dunes). Both regions have mountain chains or ridges that are oriented west-to-east and are spaced about 50 kilometers (30 miles) apart. This indicates tectonic forces have acted in a north to south direction at Titan's equatorial region and have resulted in regular effects in Titan's crust, evidence that will help scientists better understand Titan's crust and interior. Other linear features, probably related to the formation of the ridges, and circular features, perhaps eroded impact craters now filled with radar-dark (smooth) material, are also seen in the image. The largest circular feature, at bottom center, is about 20 km in diameter. This side-by-side view shows a newly discovered impact crater (at left) compared with a previously discovered crater (at right). The new crater was just discovered by the Cassini spacecraft's radar instrument during its most recent Titan flyby on May 12, 2008. This makes the fourth feature definitely identified as an impact crater so far on Titan -- fewer than 100 features are regarded as possible impacts. Compared with Saturn's other moons, which have many thousands of craters, Titan's surface is very sparsely cratered. This is in part due to Titan's dense atmosphere, which burns up the smaller impacting bodies before they can hit the surface. Geological processes, such as wind-driven motion of sand and icy volcanism, may also wipe out craters. Both images are about 350 kilometers (217 miles) in width. The crater on the right was discovered by Cassini in 2005 and is shown here for comparison. It is 80 kilometers (50 miles) in diameter (see Impact Crater with Ejecta Blanket), with the radar illumination from above. Called Sinlap, this crater is estimated to be about 1,300 meters (984 feet) deep. The new feature pictured on the left, which has not been named yet, is bigger than the Sinlap crater with a diameter of about 112 kilometers (70 miles). The new crater is located at about 26 degrees north latitude, 200 degrees west longitude, in the bright region known as Dilmun, about 1,000 kilometers (600 miles) north of the Huygens landing site. In its image, also illuminated from above, it appears slightly irregular, suggesting that it was modified after it was formed, perhaps by collapses of segments of its rim onto the floor. The crater floor appears flat, and two small bright spots indicate a likely central peak complex. The ejecta blanket (surrounding material) from this crater is less prominent than that of the Sinlap crater. The crater's more degraded character suggests it could be older than Sinlap (assuming that erosive processes are the same at both locations, which are at similar latitudes). You could watch the auroras of Saturn to be certain in is. Take a look at the right-hand photo above. Notice the hexagonal shape and swirling tracks of the electron beam IMPACT?